I'd liked to have used something from my own closet to inspire myself but my daily outfit of jeans and t-shirt really didn't provide much inspiration! Instead, I found the photo above on Pinterest - unfortunately I've no idea who to credit for the dress but I can assure you, I won't be doing the school run in it! 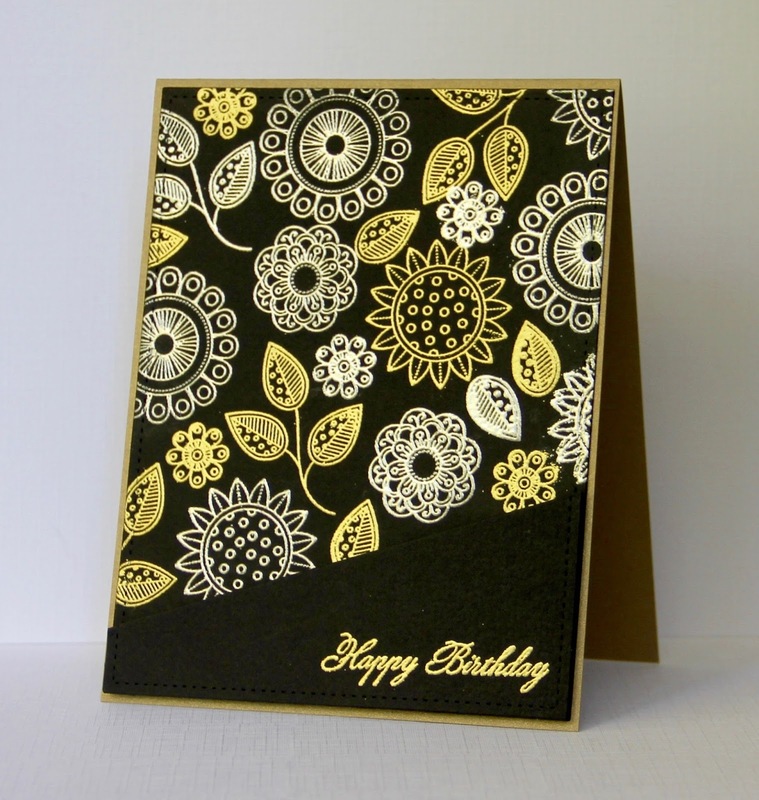 It did give me an idea on how to use Doodlie Do though - I love the way the silver and gold is peaking out of the black, fabric panels so I gold and silver embossed a selection of blooms, then partially covered it with a black panel of card stock. The sentiment is from Birthday Basics. This really does look stunning Claire. Love the black base and why not wear it on the school run!! This is stunning! The yellow on black and your stamped images just perfect! Wow,Claire! I can see this took some time to make but so worth it! WOW...this is just GORGEOUS! I love the gold and silver embossing on the black card stock...very striking! This is stunning Claire and a beautiful and creative take on the inspiration piece! In love with your card! It's stunning, super elegant, just outstanding!!! Wow! This is GORGEOUS!!! Love the silver and gold on black....perfect design! !